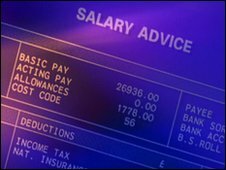 The income gap for people in different nations of the UK has narrowed over a decade, official figures show. From household figures, the average gross disposable income per head in the UK was £14,872 in 2008, up 3.9%, the Office for National Statistics said. Between 1997 and 2008, the gap between the UK average disposable income per head and the average of the various nations has narrowed. Disposable income excludes taxes, pensions and property ownership. It represents the amount of money left available within the household sector for spending or saving, after expenditure associated with income. This money can be used for a variety of spending and saving issues, including the purchase of goods and services, depositing in a bank, investing in shares or bonds or capital mortgage repayments. The average disposable income per head in England for 2008 was 1.5% above the UK average at £15,090. This raised the average, as the other nations were below the UK average, with Wales having the lowest at £13,073, followed by Northern Ireland at £13,260 and then Scotland at £14,301. But the figures show that the difference between them has narrowed. In Northern Ireland, the average was 15% below the UK average in 1997, but by 2008 was only 11% below. The position in Wales has improved marginally from 13% below the UK average in 1997 to 12% below by 2008. Scotland was 6% below the UK average in 1997 and by 2008 was 4% below. Within England, the gap between the regions and the UK average in many cases from 1997 to 2008 grew. Yorkshire and Humberside saw average disposable income per head fall further, from 8.6% below the UK average in 1997 to 11.8% below by 2008. In 1997, the South West of England had the same average disposable income per head as the UK average, but was 1% below the UK average by 2008. In London, the gap has increased from 22% in 1997 to 28% above the average UK disposable income per head in 2008. London's disposable income per head was the highest in the UK at £19,038. This was 4.5% higher than the previous year. The North East of England had the lowest disposable income per head at £12,543, 16% below the UK average, but with the gap narrowing, as the region's annual growth at 4.2% was higher than the UK average. The South West of England seemed to be the most representative region of the UK in terms of average disposable income per head at £14,680, 1.3% below the UK average. Wales and Scotland both reported above UK average annual growth in disposable income per head of the population in 2008, at 4.1% and 4.7% respectively. Meanwhile, England and Northern Ireland showed below average growth for the same period at 3.8% and 3.7% respectively.